With the tremendous increase of video recording devices and the resulting abundance of digital video, finding a particular video sequence in ever-growing collections is more and more becoming a major challenge. Existing approaches to retrieve videos mostly still rely on text-based retrieval techniques to find desired sequences. With vitrivr, we present you a fully working system for indexing and retrieving video data based on the content. The following image shows the overall architecture of vitrivr. vitrivr is composed of Cineast and ADAMpro. 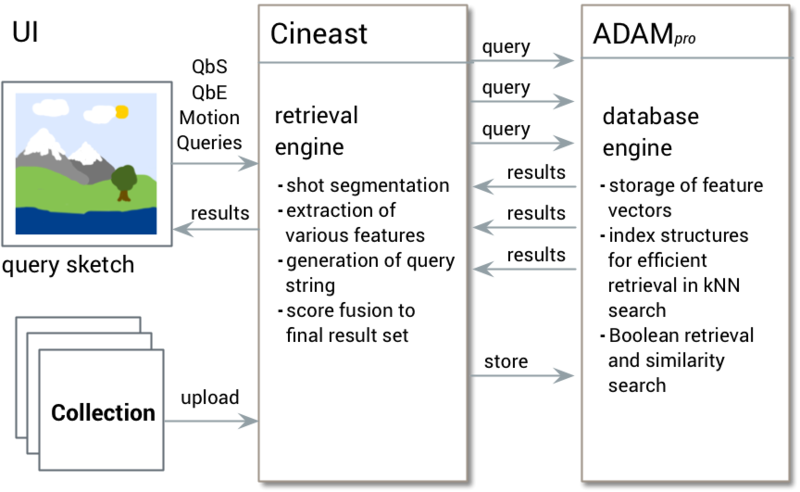 Cineast is our retrieval engine responsible for performing the shot segmentation, extracting features from the video collection and generating the query. The query is then processed by ADAMpro which is able to return the k nearest neighbors to a query in a very efficient way. Cineast then combines the results from various queries to one coherent result set. Cineast, ADAMpro and the vitrivr UI are open source and we are actively developing to improve the code and extend the functionalities. 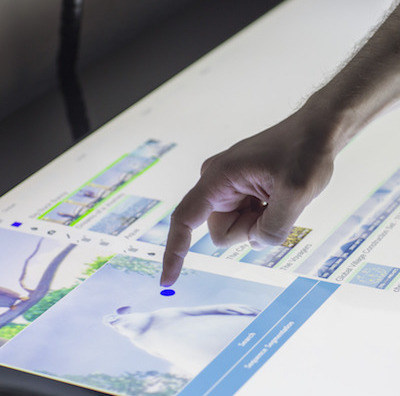 The browser-based vitrivr UI offers multiple query modes to facilitate retrieval. 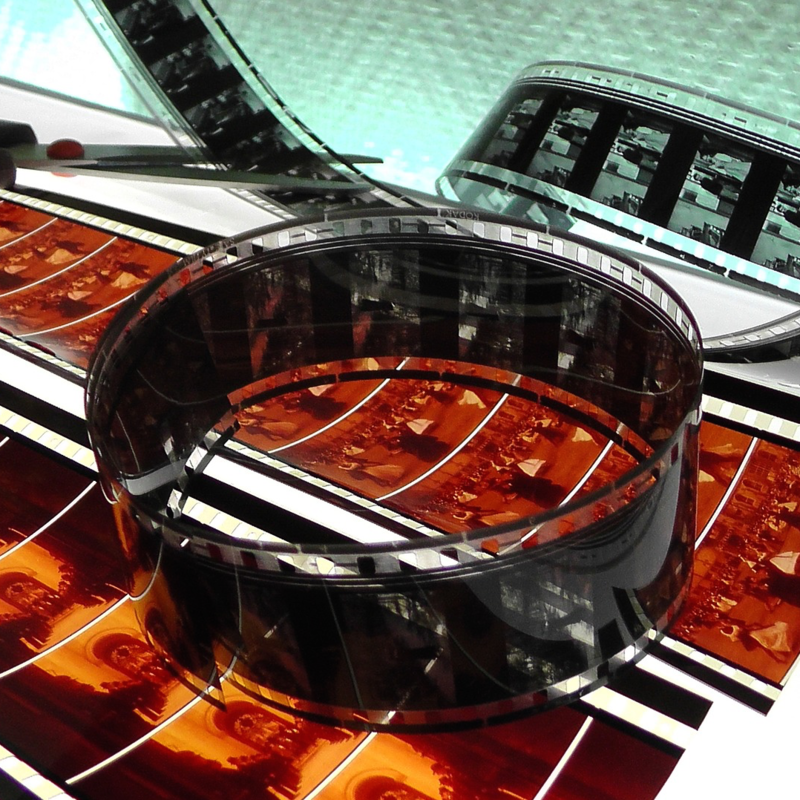 Cineast is a multi-feature sketch-based content video retrieval engine. It is capable of retrieving video sequences based on edge or color sketches and sketch-based motion queries. Smartphone-Kameras sind immer dabei und es wird ständig geknipst und gefilmt. Doch wie findet man später ein Video wieder, wenn man sich nur noch an das Motiv erinnert, nicht aber daran, wann und wo es aufgenommen wurde? Forscher der Uni Basel haben eine Bild- und Videosuche entwickelt, die dieses Problem lösen soll – mithilfe von Skizzen. Eine Skizze sagt mehr als tausend Worte – deshalb haben Informatiker der Uni Basel eine Suchfunktion für Bilder entwickelt, in der man das Gesuchte von Hand auf dem Tablet oder Smartphone skizziert. Anschliessend durchwühlt das Programm ganze Bilddatenbanken nach vergleichbaren Mustern und zeigt die ähnlichsten Bilder an. Die Anwendung eigne sich ausserdem dazu, um in Videos einzelne Sequenzen zu suchen, schreibt die Uni Basel. Damit liessen sich zum Beispiel bestimmte Bewegungsmuster in Sportvideos entdecken. 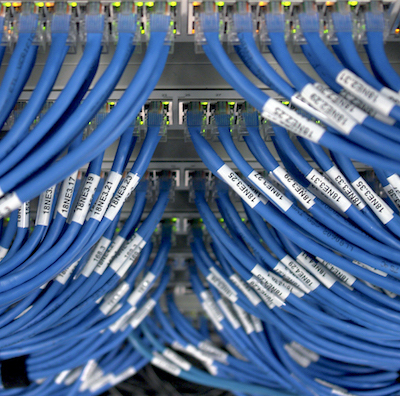 Ihren Programmiercode haben die Basler Forscher nun ins Internet gestellt. So ermöglichen sie Informatikern aus der ganzen Welt, die Anwendung weiterzuentwickeln. vitrivr has participated to Google Summer of Code 2016. We have set up a mailing list for the vitrivr project. You can use the mailing list for questions regarding the code, bugs, etc. Note that the mailing list is publicly visible. 2018, Databases and Information Systems research group, University of Basel.